Do I really need to tell you about the Carnegie Deli? It’s a New York institution, the quintessential Jewish deli of the old school. No, that’s not a knock against the excellent Katz’s or numerous other delis in town, but I think it’s very hard to argue the central role Carnegie Deli plays in the scene. My officemates were thoughtful enough to pick some up for us and bring it back to work. They made the bold and excellent decision to get some knishes. I say bold because these leviathans are scarcely needed when dining at Carnegie, which is legendary for their massive skyscrapers of cured meat towering clumsily atop an overwhelmed slice of rye bread. Either way, the knish was a good move. 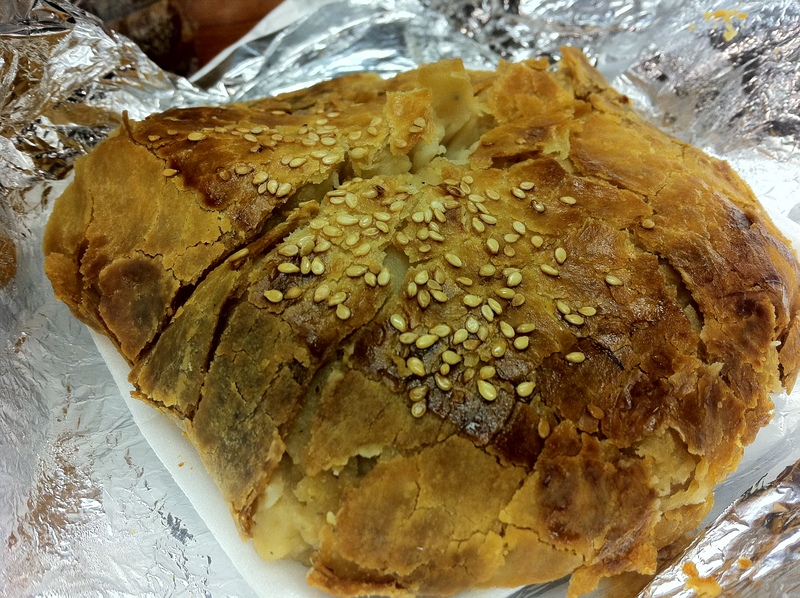 As you can see, it had a flaky, sesame-seed crust. Within was a surprisingly smooth, extremely rich and buttery preparation of potato which was widely regarded as full of win. But on to the meat. 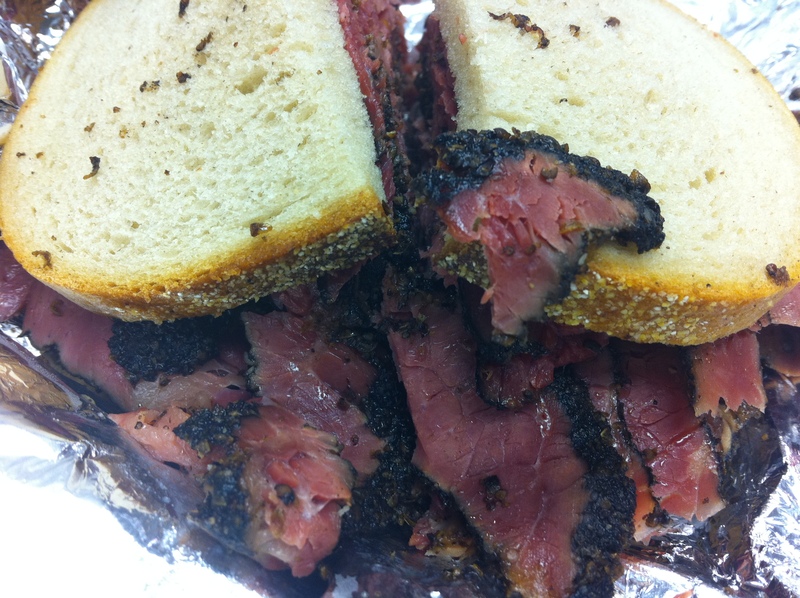 Behold the pastrami from Carneguie Deli. Now I don’t know what the precise deal is, but over the years, my reaction to their signature meat has changed. I think perhaps (although this seems inconceivable) that they’ve changed their recipe, supplier, or curing over time, because for the 30 or so years I’ve been eating their pastrami, it seems to have gone through a few iterations. I remember when they used to machine cut it so thin with meat so lean that it barely seemed to resemble pastrami (the bad years). However, in the past few years, they seem to have gotten back on track with a more flavorful, better cured, better textured meat. They’ve also toned down the size of the sandwiches. I remember when there was truly no point to having them between the bread, as one half of a sandwich had more than enough meat for one person. Now, it seems much more conceivable that one person could get through a sandwich, even with splitting the knish beforehand. I’m sad to say, though, on this particular day the pastrami meat was a bit too fatty (and here I was earlier excoriating them for serving it too lean). But when there are several large, inedible, gum-like wads of fatty gristle interfering with your enjoyment of the sandwich (and threatening to choke you) in one sandwich, you know you’ve had a poor cut. Personally, I miss the days of the hand-cut pastrami sandwich (Carnegie’s are still machine sliced, like most places in town). 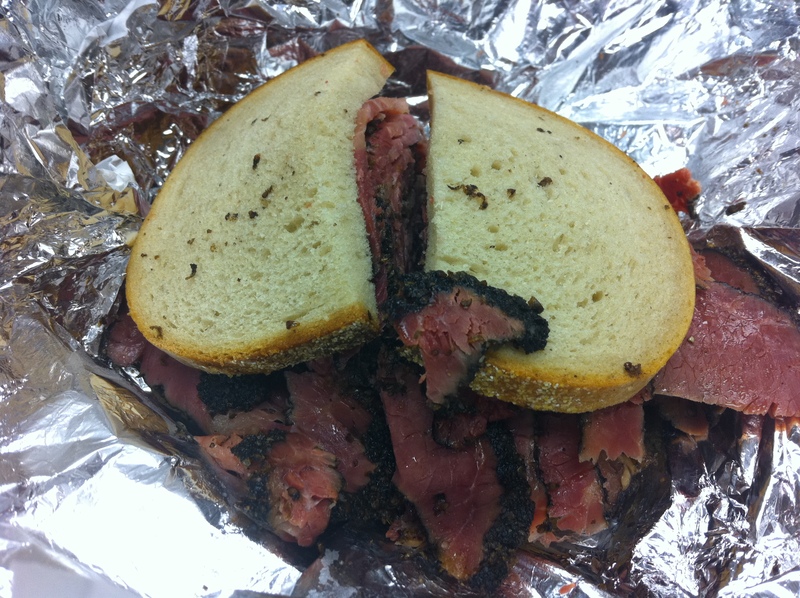 Only hand-cut pastrami delivers the complete experience, in my opinion. All that said, the flavor was right on target. The corned beef is also excellent. 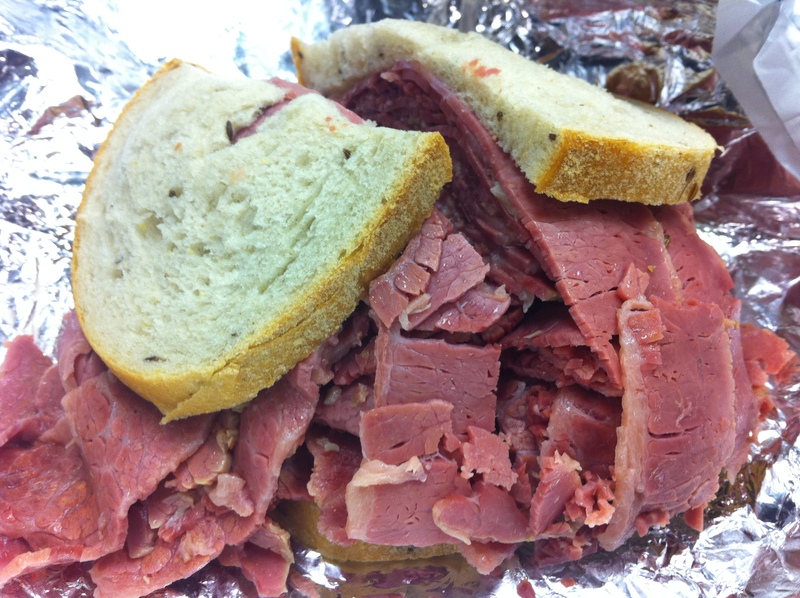 We also split a corned beef sandwich, which I always enjoy, but of course lacks the mmph-y twang of pastrami. It’s rich and delicious, but I’ll stick with the pastrami, even if this particular sandwich wasn’t the best they’ve ever rendered. Look, Carnegie Deli is a New York institution and respect must be given. The knish was surprisingly decadent, rich and tasty and I’ll get it again. The pastrami is very good these days – excellent, really – and I will continue to go back to this place for years to come, as I have before. If you’re planning a visit to New York, it’s well worth going.